Traverse City, MI (June 7, 2013)–MyNorthTickets, a subsidiary of MyNorth Media producers of Traverse, Northern Michigan's Magazine, is now selling tickets on behalf of Glen Arbor BBQ & Brew. 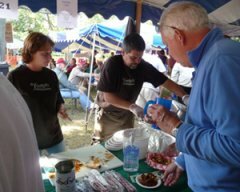 "We've supported and participated in the Glen Arbor BBQ & Brew in year's past, so we are excited to be promoting the event, adding it to our list of events, organizations, festivals and attractions selling tickets on MyNorthTickets.com," says MyNorth Media president and founder of Traverse Magazine Deborah Wyatt Fellows. "This event is one of many that demonstrates the true spirit of small town summer festivals in Northern Michigan, something that has always been part of our mission to celebrate and protect." Local restaurateurs and Northern Michigan breweries will show off their best as Glen Arbor kicks off the summer season with the annual BBQ & Brew Festival on Saturday, June 15th from 2:00pm until 8:00pm. Participating restaurants include Art’s Tavern, Cherry Republic, Blu and Western Avenue Grill. Complimenting all that great barbecue are beer selections from Short’s, Bell’s, Schmohz, North Peak, Jolly Pumpkin, Founders, Cheboygan and Right Brain and more! There will also be non-alcoholic choices from Great Lakes Tea & Spice, Bay Lavender, Cherry Republic and Northwoods Soda. Plus, live music by Erratixz for dancing to hits from the ‘70’s, 80’s, 90’s and today. Admission is $15 per person, which includes four tickets to use toward the purchase of any food or beverage. The Glen Arbor BBQ & Brew is one of many small town festivals in Northern Michigan, which will be able to process ticket sales using the MyNorthTickets services online, via phone and on-site box office management options. Services include selling tickets from the MyNorthTickets.com website as well as on each organization's website. "Someone can come to MyNorth.com, find a Northern Michigan hotel, cottage rental or a home, seek out a restaurant, hike or a picnic beach, and now get tickets to ride a boat, enjoy a show or concert or even take a cooking class. It's all right here–easy and accessible from your tablet, smartphone or computer." The MyNorthTickets website has been adding new organizations since it launched in October, 2012 and now sells tickets for more than 50 organizations. The current list of organizations ranges from Manistee to Traverse City to Leelanau, Petoskey, Charlevoix and even Mackinac Island and covers a wide variety of Northern Michigan activities including cooking lessons, winery tours, boat rides, concerts, theater, festivals and more. "We're delighted to welcome Glen Arbor's civic leadership to the list of Northern Michigan organizations included in the MyNorthTickets community," says Drew Warner, account executive for MyNorthTickets.com. "From the start, we're able to improve their visibility with our audience of more than a million and allow customers to buy tickets online 24 hours per day." The Glen Arobor BBQ & Brew is in it's second year and is sponsored by Leelanau Vacation Rentals, Art’s Tavern , Cherry Republic, Crystal River Outfitters, American Waste, Glen Arbor Bed & Breakfast, Blu, Haystacks, LuLu’s Apparel, Synchronicity Gallery, Serbin Real Estate, Quick Storage, Maple Lane Resort, Anderson’s Market, Laura Tarsa at Coldwell Banker, Northland Vacation Rentals, Funistrada and more! Glen Arbor is a quaint Northern Michigan town located in the heart of the Sleeping Bear Dunes National Lakeshore, and lies along the shores of Lake Michigan and Glen Lake. In 2011, the area was voted “The Most Beautiful Place in America” by ABC’s Good Morning America; and while we’ve seen more visitors strolling through our town, the area has still remained somewhat of a well-kept secret.